I spend my days creating powerful personal brands through LinkedIn profiles and executive resumes with creative and snazzy keyword optimization. I inject pizzazz into them to create a strong value proposition that helps separate my clients from their competition in the marketplace. I also teach my clients that they are more than just their job title which is why we need creative branding in a resume as well as in a LinkedIn profile. LinkedIn gives you 120 characters to create a headline that stands out, one that truly sets you apart from the 500+ million users. By default, if you don’t create a powerful headline for yourself, LinkedIn will just use your current job title as your LinkedIn headline. Think about that for a minute. 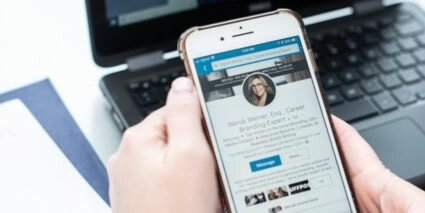 LinkedIn has been a huge game changer for many professionals in terms of job opportunities, networking possibilities, and even new introductions. How do you stand out? Are you just a sales executive? Or are you a creative change agent who makes things happen? Are you an attorney, or are you a criminal law attorney who focuses on winning for your clients’ rights? Employing creativity into your LinkedIn headline makes you fierce, different, and enables you to set yourself apart from the other professionals in your practice arena. When it’s time to job search, using your LinkedIn profile is a sure way to network and leverage your skill set – but only if it truly conveys your value. Remember, more than 94% of recruiters search for candidates on LinkedIn. If you aren’t on LinkedIn, you are missing out on 96% of opportunities. What characteristics do clients value in you? What audience are you trying to attract? Where are they? What have your employers and managers said in past performance reviews that really stands out? What do you believe makes you unique or different? What are your 3 biggest key areas of focus? If you aren’t sure how to separate yourself, consider asking a career and branding expert for help or turn to articles that discuss how to find a job in 2019. Have additional questions about your LinkedIn profile or job search? Book a consultation with Wendi Weiner, The Writing Guru, and learn how to navigate the ropes of LinkedIn. This entry was posted in LinkedIn and tagged linkedin headline, linkedin headline ideas, linkedin makeover, linkedin profile ideas. Bookmark the permalink.